Removing a user from your account will prevent the user from seeing your account when they log in. If the user has access to other accounts in CTM, they will still be able to access those accounts unless they are removed from those accounts as well. If you need to remove an agency administrator, extra steps are required. See “Removing Agency Administrators” on this page for instructions. Navigate to Settings → Users and locate the name of the user you wish to remove. Click the trash can icon on the far right side of the page. On the confirmation screen, click Remove User. 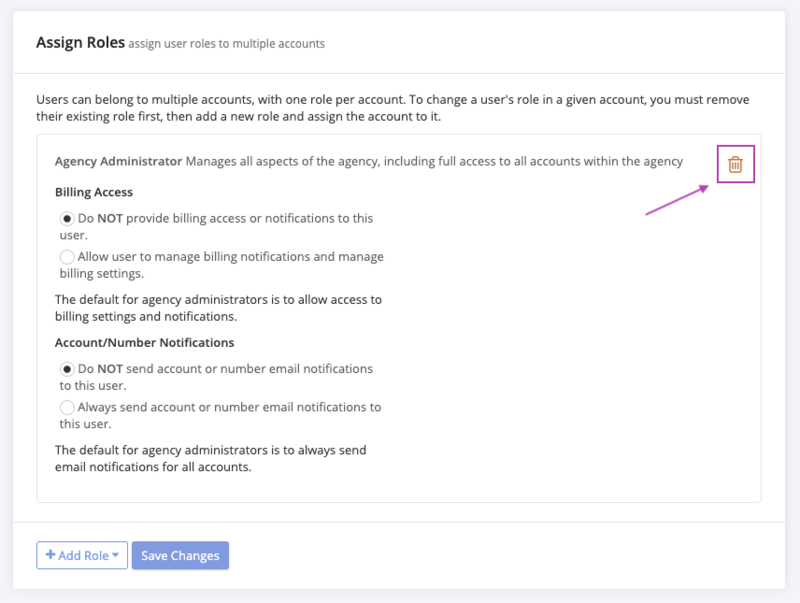 If you want to remove a user from one of several subaccounts in your agency, you can remove them one at a time from individual accounts following the instructions above. However, a much more efficient method is to edit the user’s profile instead. Navigate to Settings → Users and click edit next to the user’s name. Click or scroll to the Assign Roles section of the page. The “accounts where the user will have this role” field lists all subaccounts in your agency that this user has access to. Click the x next to each subaccount you want to remove them from. Removing agency administrators requires extra steps to ensure they are not accidentally removed from your account. You must first downgrade their role from agency administrator to another role, and then they can be removed from your agency. Click the trash on the right side to remove the agency administrator role. Click +Add Role and select any other role (such as administrator) from the list. Click the “accounts where the user will have this role” field and select the name of one account to assign the user to. Now, you can follow the instructions to remove a normal user from an account. Return to the users list by clicking Users in the breadcrumb trail or by navigating back to Settings → Users.